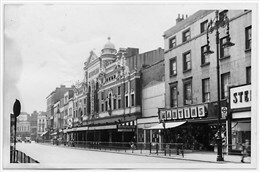 Exterior view of the Metropolitan Theatre, Edgware Road, in 1958. It was demolished shortly after in 1963. I lived in the area from 1947 until 1970 when I got married. My family lived in Whitfield House, on the corner of Salisbury Street and Broadley Street ) owned by St Marylebone Housing Association. I have many happy memories of that time – it was a very friendly place to grow up where everyone seemed to know everyone else. Church Street Market was a great place to spend Saturdays – so many shops and stalls selling everything you could possibly think of. The fruit and veg stalls were always bursting with fresh produce. I used to go shopping every week with my Mum and help her carry back the shopping. I particularly remember Jordans where I bought many things for my first home when I first got married. It was a sad day when it closed. The Met ( Metropolitan Music Hall ) in Edgware Road was a great place to visit too. I remember climbing up the tile lined walled steps to the top and sitting on the large tiered stepped rows watching lots of variety acts with my Mum. It was so exciting. We would sometimes go around the stage door after the show to see the many stars. I remember Church Street Library being built – my Mum was the cleaner there. Unfortunately she passed away a couple of years ago (aged 90). I also think about the Doctors in Church Street where the Doctor remembered the whole family and would ask how they all were every time you visited. I have fond memories of the hall next to the Four Feathers Youth Club where lots of TV and pop stars used to rehearse. We used to hang around by the door to get their autographs. Some that I still have are Cherry Wainer (used to play the electric organ, I think), Pat Coombs, David Whitfield, Una Stubbs (Dairy Box), Freddie Frinton, Libby Morris, Jeremy Lloyd and Alan Fell. I also have the autograph of Lee from the Dallas Boys when they were involved in a car crash on the corner of Salisbury Street and Broadley Street . I attended the nursery on the other corner of Salisbury Street and Broadley Street . We used to have a photo of the Shah of Persia and his wife with my young cousin, Frank, when they visited the area (unfortunately this has been mislaid). This must have been about 60 years ago. I also attended Cosway Street Primary School , Christ Church School , Regents Park Secondary School and Sarah Siddons School in Paddington Green. Many happy memories. I remember a lot of the same things Linda, although my family moved out of the area in 1964. I still am in touch with Jill Bennet (now Thomas) and Linda Lowman (now Law) but live in California. Will be in UK in September and hope to visit some of the old haunts, around Edgware Road etc. Having lived in Daventry Street (close to Church Steet) from 1943 until my marriage in 1965 I too remember all of the streets named. They were my 'playground' where I grew and learned. I attended Cosway Primary then on to Regents Park Central...worked for Mr Silk..a Church Street fruit trader for several years...as a smallboy....a daily milk round with Mr Jones each morning before school..rain or shine all year.. who ran a dairy in Bell Street next to the Salvation Army Citadel opposite Bell Street School (long before it was rebuilt as Rutherford School).We were poor and the streets were dirty but we were safe and the people cared for each other in a way that no longer exists today. My favourite memory is sitting up in the 'gods' alongside the spotligts at the Metropolitan Theatre...all for three pence and not a computer game in site.....HAPPY DAYS...!!! I lived in Whitfield house as well from 1976 until 1983 then moved across to Portman Buildings. What number did you live at Linda? I was up at the top right in the corner on the Ranston Street side. I think it was 33. I was in Marylebone recently and it seems to have changed quite a lot! Old flats replaced by new - but strangely Edgware Road on the West side still a building sight! We lived in Portman Buildings during the war at 93 then 250 and finally 96. Church Street was the place to be on Saturdays: Chocolate Joe, Tubby Isaacs and all the rest. I went to Gateforth Street School until 1952 and then to St Marylebone Grammar. I think that I was the only cockney there. It wasn't easy! Ann -We lived at No.32, and then moved to No.28 Whitfield House on the top landing as we needed 3 bedrooms. I seem to remember there was a Billy Metcalfe living on our balcony - any relation? My grandparents lived at 14 Whitfield House until it was re-modernised. We lived in No. 7 Antony House from 1933 to 1935 then we moved to Battersea so I went to Regent's Park Central School it was called then! And then to Battersea Central School. In 1937 we lived at Number 1 Whitfield House where my dad Bill Crooks was caretaker, but my parents had a wanderlust and we moved once again to Southfields and were there until 1940. Lots of places since then but I have NOT got a wanderlust because I have lived at my present address for 65 years having moved in brand new when I was 26 years old with my husband and son - I am now 91! Just been reading all your interesting comments. I lived in the Edgware Road at number 289 which was above H L Smith's, the Radio shop from 1948 until my late Mother died in 1993. I attended Bell Street School where one of my teachers was Mr Ross. Sadly, 289 has been knocked down, awaiting redevelopment, but I follow very much of the details as I have been living in Wiltshire for some years. I have been reading your comments and I lived in Windrush House off Church Street in the early fifties and went to Gateforth school until we moved to Crawford Mansions in Marylebone and then went to St Mary's School and then on to Christopher Wren school in Shepherds Bush. Does anybody remember the ice parlour in Edgware Road just around the corner from Church Street ? I lived in Windrush House from 1950 to 1954 and went to Gateforth School and remember getting free ice-creams from Regent's Milk Bar in Edgware Road.